Article XII, Section 3 of the F.S.M Constitution and Title 55, Chapter 5 of the FSM Code authorized the Public Auditor to direct a broad, comprehensive program of auditing within the National Government. 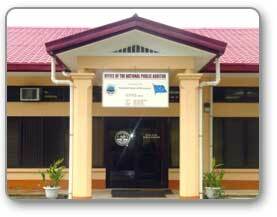 The Public Auditor's office is authorized by statute to examine and evaluate the adequacy and effectiveness of systems of management control provided by the National Government to direct its activities toward the accomplishment of its objectives in accordance with National Government policies, plans and directives. In accomplishing these activities, the Public Auditor and members of the office of the Public Auditor are authorized to have full, free and unrestricted access to all National Government functions, records, property and personnel including States and nonprofit organizations receiving funds from the National Government.